The first question that the farmers ask is … What is Directing Sowing ? A lot of people get confuse and think that it is planting directly into the ground. Direct Sowing belongs to an integrated system of grain production that evolved to planting crops without any tillage and permanent soil cover with crop residue. One of the main problems not only in Argentine but also in the rest of the world regarding forage and grain production is the amount of available water for the different crops. In most cases this problem is not due to lack of rainfall but problems in colletion, storage and losses by runoff and evaporation of the water. 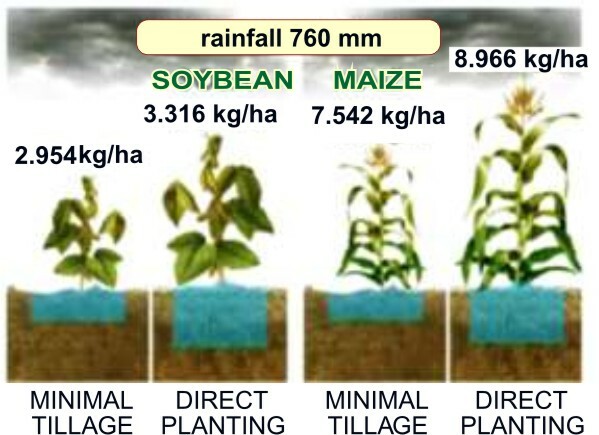 This is because, traditional tillage and traditional management produces the braking of the soil structure making less and less water collection and storage, in such a way that only 50% of the rainfall is used by the crops. Along with them we also suffer losses of organic matter (OM) of the soil (humus) due to the constant laboring of it. Organic Matter´s is essential for both chemical and physical fertility of the soil; providing nutrients and helping it keep stability in the soil structure and due to that promote soil water. It is well known that Argentine is the world leader in adoption of Direct Sowing technology using it in 81% of its surface representing 27 million hectares. But not only in Argentine this technology has expand its borders. Direct Sowing is been apply with great sucess in places where we never thought that it would wok before. Very good results have been recently obtained both in Russia´s Stavropol region and in Kazakhstan in the region of Kostanay. In those regions trials are been conducted and the year 2011 will be the fourth one under continuously Direct Sowing; the results of those trials are very convincing against traditional tillage. * Reduces the use of machinery, 40% reduction in fuel consumption against traditional tillage, and finally it allows to obtain between 25 to 40% increase in the yield with higher stability trough the years. All these benefits indicates that by adopting Direct Sowing the farmer will increase his income, reduce working hours and stress, therefore he will improve his lifestyle. All this, with better use of natural resources. Argentine is the country that has the biggest grain production per capita worldwide. First Argentine with 2309 kgrs. of grain per capita, follow by Canadá with 1910, Australia in 3rd. place with 1678, USA in 4th. place with 1670, and then in the 10th. place Brazil with 704 kgrs. of grain per person per year. Argentine evolved from 980 kgrs. of grain per capita in the 70´s, to 1218 kgrs. / capita / year in the 90´s. This was not only due ti Direct Sowing but also to a series of technological and social/political factors that led to a deep change of the production system where the technology and its proper performance have an important role. Argentine has 40 million people and produces food for 400 million people in the world. In the last 15 years, due to the implementation of Direct Sowing, advances in agricultural machinery and biotechnology, Argentine has experienced tremendous growth, doubling both its production and cultivated area, achieving new records in grain production. In the early 90´s we can see that the adoption of Direct Sowing begins to have a significant positive response. From the lat 90´s the growth was already very intense but the introduction of advances in biotechnology gave a radical change in Argentinean agriculture. In Argentine, the consequences of having tilling productive systems that stayed per decades, brought along the degradation of biological and ecological integrity of the soil system. Between the biggest damages, wind and water erosion cause drag of particles in suspension causing pollution of water resources, and other phenomenon, that were accentuated in the conventional tilling systems. Also we have to add the losses of Carbon as Carbon Dioxide (CO2) by oxidation of the Organic Matter (Humus) of the ground, produced by the conventional tillage. The most fertile layer of the soil is in the first centimeters of it. Once disappeared, nature takes thousands of years to create it again. In Argentine, 40 years of tillage, made lose in average 2% of Organic Matter of their soils, taking 50% of their potential fertility. If to the losses we consider the current values of the nitrients that goes away of the soil, Argentine would be losing 134.508 millions dollars. The rotation of crops with different root systems, promote the regeneration of pores, fauna and soil biological activity. This leads to a better soil structure for more efficientuse of water by reducing runoff and evaporation losses. In Argentine with Direct Sowing, up to 100 mm. of useful water are again every year compared to conventional tillage, and according to the efficiencies in use of the water from each crop, it represent an increase of 1700 kgrs. of maize, 1400 kgrs. 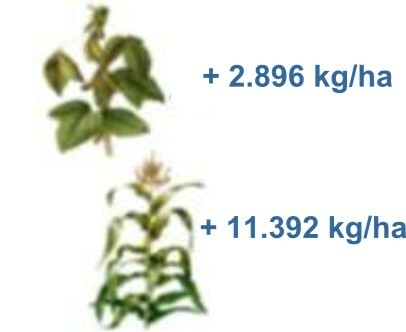 of sorghum or 800 kgrs., of weath per hectare a year. As an example, INTA Manfredi has been making a continuous trial for 8 years comparing different tilling system and crops rotation of maize and soybean that are made under Direct Sowing and minimal tillage system. The results are convincing and are reflected in the schematic picture. As far as yield concern, the difference was also significant in both crops. Such a difference expressed in average in those 8 years is equivalent to a complete harvest in favor of Direct Sowing, in the economic evaluation we must add a great saving in fuel, equipment and personnel. 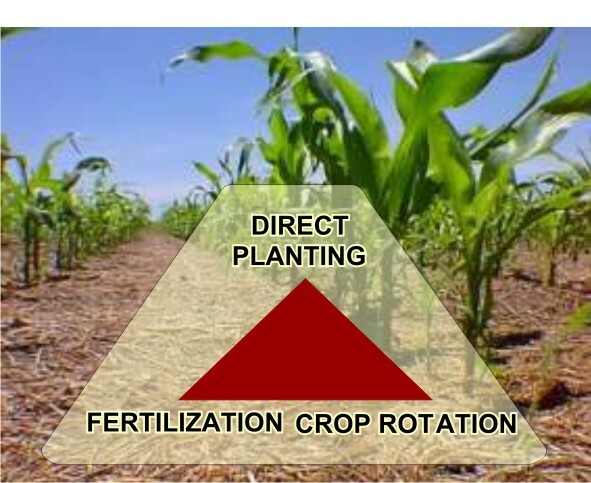 Direct planting is the most evolved system to plant without any tillage; this system eliminates any kind of tillage. Another main feature is that a permanent residue cover stays over the soil. In order to be efficient, the system must go together with an agricultural machinery complex specially designed. In that way, the most outstanding feature of Argentinean farmers is that they are very demanding, always seeking for farm equipment improvements and adapt them to different agronomic environments throughout all the country. This forced the local industry to joins this demanding process. After gaining such experience all the companies were able to adjust to different situations worldwide against different places of each productive region of the planet. At the moment, Argentine exports farming equipment to 32 countries and acquiring Argentine technology, does not only means the acquisition of metallic components, but also “Know How” accumulated trouggh many years of experience of technicians, institutions, farmers and industrialists. Argentinean agricultural machinery exports are growing very fast. This is strictly related with Argentine´s policy of creating a network between machinery manufacturers, institutions (INTA) and specialized government organism to find the exact configuration to solve all the problem of every productive region where the country exports its products. The agricultural machinery complex of Argentine has 65 planter´s factories; such quality offers us a wide variety of products. Due to different ecological region troughout the country each manufacturer is flexible enough to acquire the experience needed to set up the planters according to costumers´requirements. In addition to that the machinery complex also has 60 manufacturers between spryers and self-propel sprayers and the other main player in the Direct Planting cropping system. 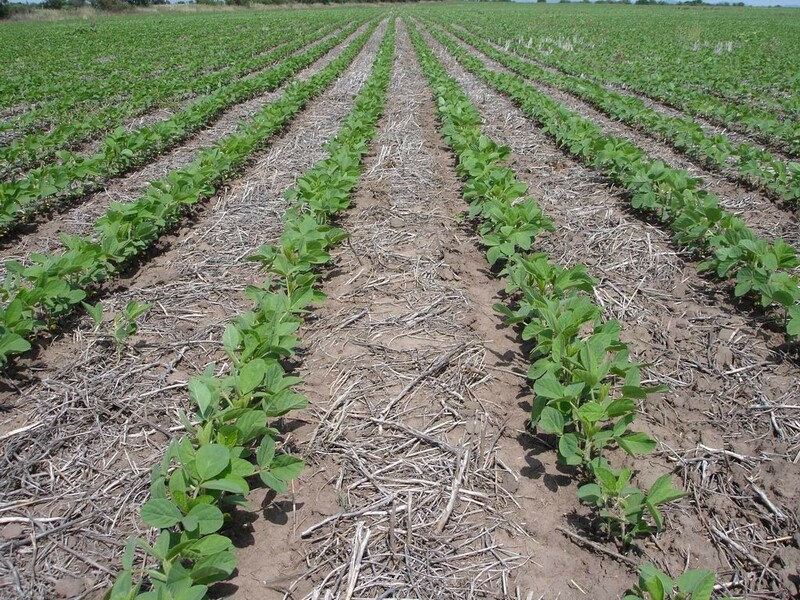 Argentine is the country with the highest productivity in soybean crop in the world; this was reached by having an 81% of the surface in Direct Planting with 95% of planters and sprayers made in Argentine. Agriculture belongs to each place, but the basic principles are the same throughout the world. Therefore, the key concept is to adapt the technology to the ground and not the technology.